This is in response to your memorandum of November 19, 1990, which transmitted a November 6 request from the Little Rock Area Office regarding interpretation of the written requirements of employers on multi- employer worksites. I apologize for the delay in this response. The situation as we understand from your memorandum involves a citation issued to the Department of Defense Contract Management (DCMR) for exposing two of their employees to the same hazards that the employees of the American Fuel Products Company (Amfuel) in Magnolia, Arkansas, were exposed to. The DCMR employees were working at the Amfuel worksite. The DCMR did not have a written HCP on-site for its own employees (who were acting as quality assurance representatives) but was relying instead on the written HCP of their "host" employer, Amfuel. According to your description, DCMR's employees "were aware of" and had received hazard communication training from Amfuel, which was provided to them as part of their host employer's hazard communication program. You questioned whether this practice, the use of Amfuel's HCP for the DCMR employees on Amfuel's site, meets the intent of the standard, and if not, what must DCMR do to comply. All employers with employees exposed to hazardous substances must develop, implement and maintain a written HCP. CPL 2-2.38C stresses, on page A-13, that "programs must be developed whether the employer generates the hazard or the hazard is generated by other employers." And, on page A-15, "All employers with employees potentially exposed to hazardous chemicals therefore must have in place an effective written hazard communication program that details how this intent will be met." As you point out in your memorandum, and as set forth in the directive, the "intent" of the standard is met when information on the hazardous chemical substances at the worksite is available to all affected employers and employees. This does not mean, however, that an employer can not have a written HCP. Each employer must have their own written hazard communication program which must be in place and available to all their employees. 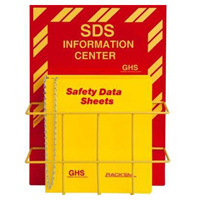 The standard at paragraph (e)(2) requires that the written HCP specify the methods that employers at multi-employer worksites will use to share information with other employers and employees regarding MSDSs and access to them, precautionary measures and any labeling systems used at the workplace. If an employer is going to rely on the information concerning these requirements as set forth in another employer's HCP, he must specifically state so in his own written HCP. In other words, the "guest" or "non- host" employer would have to specify in his written HCP that his method of providing hazard communication information as required is to rely on the methods set forth in his host employer's written program. Employees of the "guest" employer have a right to know and to access the information that must be contained in their employer's hazard communication program. Where they go to get this information is their own employer's written HCP. The methods their employer is going to use to communicate chemical hazard information to them must be set forth in writing in their own employer's written HCP, even if that method involves relying on a host employer's written program. I hope this is responsive to the concerns you raised. Please feel free to contact Melody Sands of my staff (FTS 523-8036) if you have any further questions. The attached request dated November 6, 1990, from our Little Rock Area Office is forwarded for your review and clarification of subject standard. Please forward your response to Jerry Bailey, Assistant Regional Administrator for Technical Support. This request for interpretation/clarification of 29 CFR 1910.1200(e)(4) and OSHA Instruction CPL 2-2.38C, dated October 22, 1990, is submitted for your appropriate action. This office recently conducted an inspection at American Fuel Products Co. in Magnolia, Arkansas, at which two employees of the Department of Defense Contract Management (OS ANQI) were stationed as quality assurance representatives. As they were exposed to the same potential as the Amfuel employees, a Notice of Unsafe or Unhealthful Working Conditions was issued on September 24, 1990, and an extension of abatement date to November 19, 1990, was granted on October 23, 1990. The Notice contained two violations: i.e., 29 CFR 1910.1200(e)(4) and 1910.1200(h). Although this notice was issued prior to the issuance of CPL 2-2.83c, this CPL raises some questions as to the abatement of the violations. In addition, the OCMD has the same situation throughout the United States. Therefore, this interpretation and application of abatement has nationwide consequences for that Agency. The DCMR employees are aware of, and have been trained as a part of the Hazcom program for the host, American Fuel Cell Products Co. Therefore, the questions for interpretation are (1) has the intent of the HCP been met by the use of the Amfuel HCP for DCMR employees; and (2) if the intent has been met, what should be contained in the DCMR HCP onsite that will detail how this intent will be met, or should there be one at the site for DCMR employees. As this Notice is still open, and the DCMR has requested abatement assistance, a prompt reply will be appreciated.